The following article first appeared in AdvocateDaily.com, November 22, 2018. 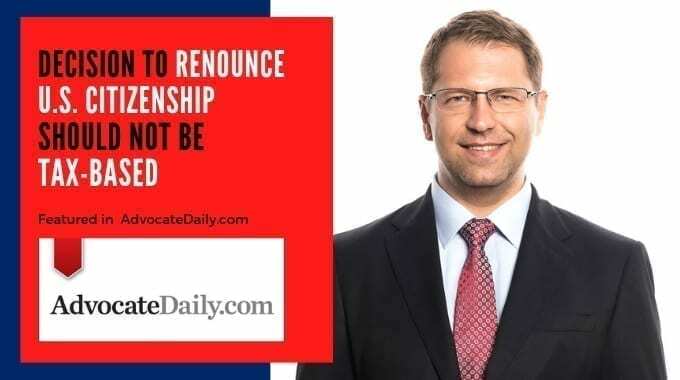 For American citizens and Green card holders living in Canada, the overwhelming nature of complying with tax filing requirements may lead some to consider the step of renouncing their citizenship — but, as Oakville-based U.S. tax attorney (NY, DC) Alexey Manasuev tells AdvocateDaily.com, this decision should not be based solely on tax concerns. As Manasuev, principal of U.S. Tax IQ explains, although the requirement for expats to file a U.S. tax return has existed for years, the changes brought by recent American tax reform, including the Foreign Account Tax Compliance Act (FATCA) implemented in 2014 and the Tax Cuts and Jobs Act, enacted in December 2017, have complicated the situation for many individuals. “There has been a much higher awareness as to the U.S. tax filing and reporting and disclosure obligations that American expats have while they live outside of the United States. The IRS and the U.S. government are enforcing the laws that have been in existence for a long time. The new law does not make it easier. This may have caught many people by surprise. And there has been a huge compliance initiative — people were using the offshore voluntary disclosure program until its recent closure, and the still existing IRS amnesty programs, to become compliant,” he says. Even in situations where there may be no additional tax to pay, Manasuev says all U.S. citizens or Green card holders may be required to file a U.S. tax return. In addition, says Manasuev, any American, whether they live in the United States or elsewhere, is required to disclose their foreign bank accounts ….